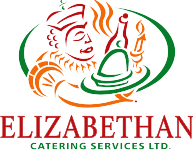 Corporate Plate Service - Elizabethan Catering Services Ltd.
A Plate Service Meal is probably the most elegant way to serve your guests. The guests stay seated at the table and are served course by course. There is no way to rush a plate service, so if time is of the essence for you, probably a Buffet Meal is more appropriate. You should allow between 30 – 45 minutes per course. Some facilities also are not conducive to a plate service meal, as a large kitchen/dishing area is required. At least 16’ of tabling, out of sight of the guests. If you are considering a plate service, we can advise whether it is feasible or not. How many courses would you like. Traditionally, a five course meal consists of Soup, Salad, Fish Course, Main Course and Dessert, in that order. Portions are arranged accordingly, so that the guests have had enough to eat, by the time the meal ends. Plate service meals can be very pretty, elegant courses, with a great deal of emphasis on decoration and plating of each menu item. They can be for a small intimate setting or a large gathering. All menus for plate service meals will be custom designed to your tastes and we are always available to assist you with your choices. Regardless of the number of courses you decide upon, we can suggest various ideas to complement each course. The sample Five Course Meal items were selected for their balance and texture. As a guideline, allow 30 – 45 minutes per course, so you can decide exactly how long a meal will take to serve. A three-course meal will take about an hour and a half; five-course meal about two and a half hours to three hours. We will never rush your guests, and we will pace ourselves according to the eating speed and direction that you give us. OUR MOST POPULAR THREE COURSE MEAL! ALTERNATE MENU CHOICES LISTED BELOW. FEEL FREE TO CHANGE ANY ITEM FOR ANOTHER ONE. SOME MENU CHOICE ALTERNATES MAY INCREASE OR DECREASE THE PRICE, SO PLEASE DISCUSS WITH YOUR SALES ASSOCIATE. CAN BE PRE SET ON THE TABLES, PRIOR TO SERVICE. Paper thin slices of smoked Atlantic salmon served with capers, finely sliced onion & brown bread points. EACH PLATED MEAL SHOULD CONSIST OF 1 PROTEIN, 1 STARCH, 2 VEGETABLE CHOICES & BREAD SELECTION. MULTIPLES CHOICES CAN BE SERVED, IF REQUESTED, BUT CHARGES WILL APPLY. VEGETARIAN, CELIAC AND OTHER DIETS CAN BE ACCOMODATED. PLEASE SPEAK TO YOUR SALES ASSOCIATE WITH YOUR WISHES. An 8oz. Chicken breast, stuffed with ham and swiss cheese. Breaded. A medley of rice, barley and wild rice, cooked in chicken stock. Traditional, hand made pasta, which presents well and well fla.
Mediterranean whole green beans, steamed and tossed in olive oil, garlic and basil. Very flavourful. With ginger & dill small batons of carrots, cooked with orange juice, ginger and dill. Button mushrooms, sauteed with oil, seasoning and tarragon. Florets of broccoli, steamed and tossed in butter and sesame seeds. Steamed sweet green peas. Tossed in seasoned butter with hint of mint. Can also be paired with baby carrots as a popular vegetable mix. Sliced red cabbabe, cooked in a blend of spices, with orange and apple juice. The tastiest way to eat cabbage! Bundles lightly steamed heads of green asparagus, wrapped in bacon and baked. Steamed with onions, butter, seasoning and bacon. A very popular dessert. Rich and decadent.